Marvel's most awesome heroes continue their adventures! Black Widow's strength and cunning will be tested to their limits as she takes on a mission too dangerous for S.H.I.E.L.D.! Let battle commence as Captain Marvel wades into an interplanetary turf war! Ms. Marvel checks off another super hero rite of passage: a team-up with Wolverine! 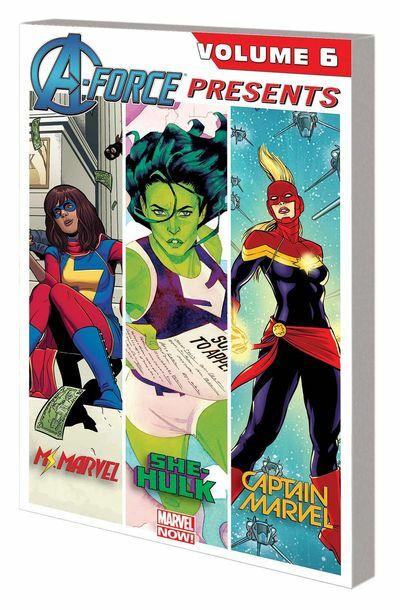 As the mysterious Blue File turns friend into foe, who can She-Hulk trust? The Odinson continues to narrow down the possible answer to the question on everyone's lips: Who is the new Thor? And Squirrel Girl meets Girl Squirrel - and also a hippo! Grade A excitement, guaranteed! Legal Notice: Entire contents trademarked (® or TM) and copyrighted (©) 1986-2019 by Things From Another World, Inc. and respective copyright and trademark holders. All rights reserved. Page rendered at 2019-04-25 21:34:52 in 0.294 seconds.